I learnt something interesting today. Pastor Marvin was preaching on the Holy Spirit being the one who reveals the Word of God to us and he opened his sermon with reference to the Rosetta Stone. I have heard of it before but I've never found out anymore beyond that. I've always thought that hieroglyphs are pictorial in nature, something like the Chinese language, only to learn today that it is actually a language of "combined logographic and alphabetic elements". The "hieroglyphic signs are phonetic in nature, meaning the sign is read independent of its visual characteristics." Apparently, that was only discovered not long ago in 1822 with the help of the Rosetta Stone. 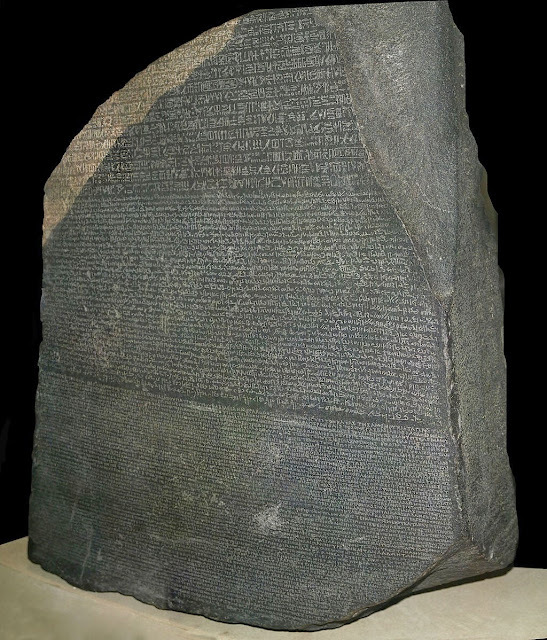 The stone has three sections of the same content in three languages - the upper text is Ancient Egyptian hieroglyphs, the middle portion Demotic script, and the lowest Ancient Greek. It took Jean-François Champollion 20 years to transliterate the Egyptian scripts, based on the other two scripts. And with that, "the term Rosetta stone has been used idiomatically to represent a crucial key to the process of decryption of encoded information, especially when a small but representative sample is recognized as the clue to understanding a larger whole." And that's where I've first heard of it, i.e. being idiomatically used.